What garden is complete without zucchini? Sliced, shredded, or prepared your favorite way, garden fresh zucchini is truly versatile. 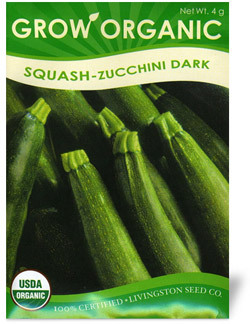 These seeds are also 100% CERTIFIED USDA ORGANIC. Plant after danger of frost. 5 to 7 seeds per hill, thin to 3-4" or 2-3 plants per hill. Matures in 50 days.